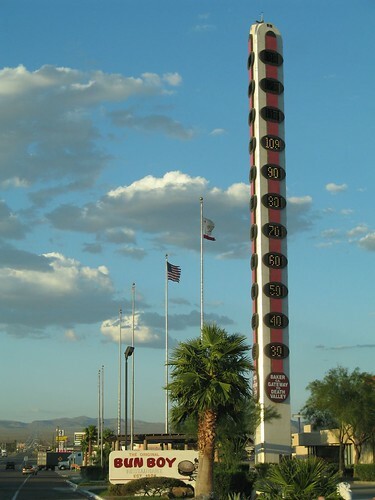 This 134 feet (40.84 metres) high Giant thermometer located in a small town Baker, CA, USA is the largest Thermometer in the World. It is a monument to highest temperature of 134° F (56.7° C) recorded in USA. The height of 134 feet symbolizes the record high temperature of 134° F recorded in nearby Death Valley on July 10, 1913. It is reported that a businessman, Will Herron had dreamt of a huge thermometer for 25 years before he had it actually made in the California's high desert. The thermometer was built in 1991 by the Young Electric Sign Company of Salt Lake City, Utah. In reality the structure is a display sign whose three sides show the current temperature from three directions. Note: The extreme temperature ever recorded on Earth is 57.8 °C (136 °F) at Al 'Aziziyah, Libya on September 13, 1922. The second highest is in Death Valley referred above.